This well-located trough serves two horse fields. Photo by Bill Steele. For many horse keeping operations, springtime rains brings saturated soils, flooding and lots of mud. But in other regions, April is one of the driest months of the year, creating a peak demand month for water use. It is fitting that many jurisdictions recognize April as Water Conservation Month. Wet climate or dry, the approach of spring is the perfect time to improve water management techniques. A few simple, practical actions can help conserve water and protect water quality. 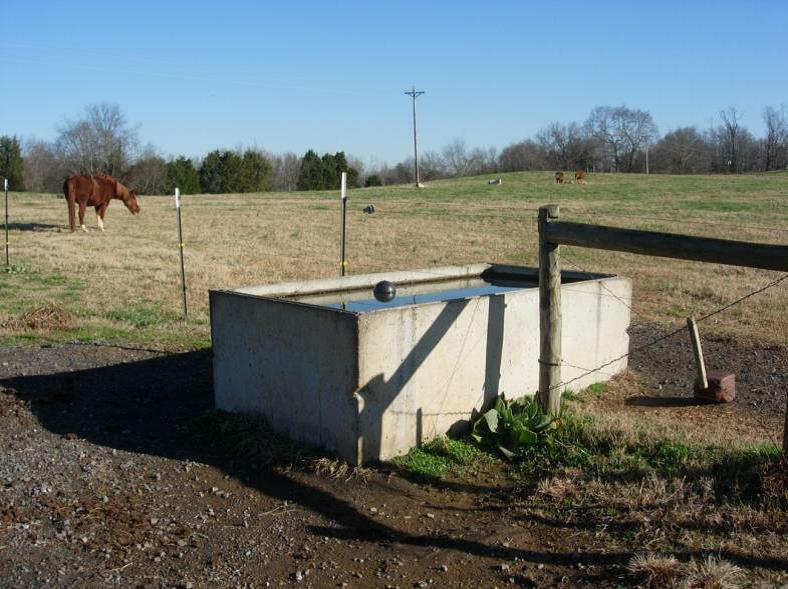 Horse farms and facilities depend on water for a number of purposes in their daily operations. This includes water for livestock consumption, water for maintenance, grooming and general cleaning, water for applying fertilizer to and irrigating hay and other crops, as well as water for human uses. Water consumption for these tasks can be reduced by utilizing these practical and inexpensive methods. Drinking water for livestock: Each horse consumes an average of 12 gallons per day. Install waterers that can serve two or more paddocks to reduce trough cleaning and water loss from evaporation. Recycle and reuse the water from horse water buckets for irrigation. If you live in an area with plentiful rainfall, you can use rain barrels, cisterns or troughs to collect and store rainwater from roof downspouts. Barn cleaning: Use absorbent stall bedding and a push broom to lessen the need for hosing down stalls and alleyways. Use nozzles on hoses. Horse bathing: When you can, give your horse sponge bath on the girth area and other sweaty parts instead of a full shower, and groom well when dry. Dust control – use washed sand or gravel in arenas and high traffic areas to reduce the need for wetting down to control dust. Specialized dust reducing treatments and surface materials are available, but can be costly. However, if you use a municipal water supply, rates may be high enough to justify special surface materials and treatments. Lawn and paddock irrigation: Irrigate in the early hours of the morning to prevent plant mold and disease. Make sure sprayers are aimed low and directed for complete coverage without spraying beyond the area that needs irrigation. Water once until the ground is well soaked (down to a depth of three to four inches) rather than for shorter, more frequent periods of time. Shallow or short term watering results in poor root formation and a weak plant. Buildings: Install low flush toilets and limited flow faucets. Use recycled or collected “greywater” to irrigate plants around the building. Before: Livestock and Stormwater erode the stream banks and destroy habitat. In times of heavy rainfall, horse farms and ranches in wetter climates can experience soggy fields, lowland pools and extended periods of mud. In these situations water quality, rather than quantity, is at risk. Storm water needs to be given the opportunity to infiltrate through the soil and into the water table before running into ponds and waterways. Steep slopes, compacted soil, little or poor quality vegetation and impervious surfaces such as parking lots and buildings located nearby can create runoff issues. Water pooling and soggy soils provide breeding environments for flies, mosquitos and other parasites. Manure piles and chemical/fuel storage locations are sources of pollution that, if not addressed, can send enormous quantities of pathogens and organic materials into streams. Fast running stormwater can quickly erode soil as it progresses through drainage ways to streams and rivers. Not only is valuable soil lost, but it clogs and destroys riparian habitat. After: A vegetative buffer and prevention of livestock access to the stream protects water quality and enhances habitat. Photo courtesy of the University of Kentucky. There are a number of practices equine operations can implement that protect water quality, reduce insect populations and improve livestock health. Rooftops: An inch of rain on a 20 x 50 foot barn roof produces 620 gallons of water. Install rain gutters and downspouts on farm buildings. Direct this water to an infiltration area and away from paddocks, muck pits and sacrifice lots. A well-designed sacrifice area allows stormwater to infiltrate while protecting surrounding pasture turf. Photo courtesy of of the University of Maryland, the Equine Rotational Grazing Demonstration Farm. Gravel: The size of the base layer depends upon the soil type. Heavy clay soils may need several lower inches of large gravel with a finer grade above, e.g. 3/8 to 5/8 inch, and a finer third surface layer. Each layer should be separated with fabric to prevent migration of the particles. Manure management: A fully grown horse (approximately 1,000 pounds) produces 40 to 50 pounds of feces and urine daily. Manure and stall waste may be spread on pastures after composting or composted for other uses, such as energy production or as organic fertilizer. Composting can reduce the volume of waste by 40 to 60 percent. Composted material provides flexibility in spreading schedules, reduces odor, and destroys insect eggs, pathogens, weed seeds and internal parasites that can re-infest horses. When compost is applied to the soil, it improves the soil’s water holding capacity, increases microbial activities and improves overall soil texture. To reduce surface runoff that can wash pollutants out of the compost pile, waste should be stored on compacted clay soil or an impervious base and covered with a tarp. The covering will help the pile retain moisture during dry periods and raise core temperatures to kill pathogens, weed seeds and fly larvae while encouraging the microbes necessary to break down complex organic structures contained in the waste. The compost pile should be turned periodically. or mixed vegetation. Maintain a vegetated buffer strip above compost bins, around paddocks and on land areas located within a protective zone extending out from the top of a water body. A buffer strip located near other farm buildings or activities can also be used to grow flower and vegetables, or wood products in or near stream buffers that can provide additional farm income. Infiltration mechanisms: Buffer strips can also function to help runoff infiltrate into the soil by designing the strip to be a swale, with higher edges and a lower center point throughout. Infiltration mechanisms allow stormwater to penetrate the soil and move into the water table. By slowly seeping through the soil, pollutants are removed and held or broken down by plants in the soil. Infiltration basins and rain gardens often utilize sub base gravels and geotextiles to facilitate water movement when soils are compacted. These should be strategically located downslope from likely pollutant and high volume runoff sources. Your facility may have access to treated municipal water, derive your water by collecting and storing stormwater, or pump water from local wells. In each case there are compelling reasons to protect and conserve water. Though water management practices must be modeled to suit the region, soils, slopes, climate and other factors, good water management practices, incorporated into your overall land management program, can be utilized to help protect the quality of water for your operation and for everyone downstream.